According to the ASPCA, 44% of all households in the United States have a dog, and 35% have a cat. Scientists estimate that our furry friends began living among our earliest ancestors 18,000 to 32,000 years ago. In fact, the wild relatives from which our docile pets can be traced back to still roam the planet today. While our dogs and cats each have their own unique personalities, the transformation from vicious predator to cuddly companion has not shaken some of the instincts ingrained during domestication. 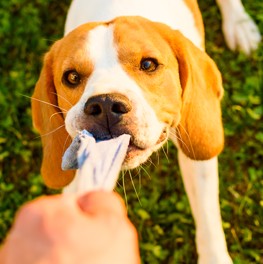 Learn about the common behaviors and traits our pets have inherited, and how you can satisfy these needs through playtime. Experts believe that dogs were the first animals to be domesticated more than 15,000 years ago, and that all breeds originate from the small, South Asian wolf. Dogs became man’s best friend while humans were still hunter-gatherers following the migration patterns of herds. Early canines were drawn to camps by the luring smell of food, and followed to scavenge left over scraps. Humans quickly realized the protective nature of wolves (as they would bark and growl whenever predators were near) and began to feed them willingly. Our two species became forever bonded because of fierce loyalty and trust. The wolves eventually changed, their temperament gaining a docile disposition, becoming less fearful. Their paws, teeth and bodies shrank; they learned to recognize the expressions and tonality of humans. Wolves turned into dogs. While dogs have been domesticated for a very long time, they have undergone even more changes. Humans have used selective breeding techniques to create new breeds with specific, desired qualities. Cats were first domesticated in the Near East close to 10,000 years ago. 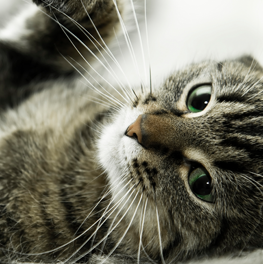 All housecats in the world today can be traced back to a single ancestor, the African wildcat. Cats are unique because they seemingly domesticated themselves without human intervention. When humans stopped following herds to make more permanent settlements, they began to farm and harvest crops. Grains attracted rodents which attracted cats. Humans appreciated the prowess of the felines and their aid in controlling mice and rat populations which in turn salvaged food. Cats quickly became desirable, causing humans to protect and feed them. Cats are most famous for their role in ancient Egyptian culture where they held high esteem and were represented by several feline goddesses, the most celebrated being Bastet. Egyptian priests often maintained large catteries and placed mummified cats in luxurious pyramid chambers. Cats have become a domesticated companion animal without changing much from an evolutionary perspective. Housecats look similar to their wildcat counterparts. The intention with dogs was to perform certain tasks, which is why there is greater diversification in recognized breeds today. As pet owners, most of us are aware of the importance in giving our dogs and cats plenty of physical and mental exercise. Safely engaging in activities that allow their natural, predatory instincts to flourish will help focus tendencies like stalking, chasing, grabbing and hunting into positive reward-based play time. Toys assist in fulfilling a dog’s emotional and physical needs. Although most dogs today are kept as companion animals, they still require tasks in the absence of a ‘job,’ and they will look for things to do to occupy their time and stimulate their needs. To prevent your dog from becoming bored and destructive, provide them with appropriate toys. Your dog’s wolf descendants take part in a natural canine behavior called ‘prey-carrying.’ After a successful hunt, sometimes wolves will carry their meal back to the den to be eaten within the safety of the pack – essentially retrieving dinner. 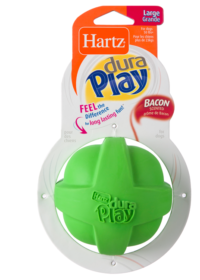 The game of fetch is a simpler variation of this, and Hartz Dura Play toys fit the bill! The soft and lightweight foam interior is outfitted with a durable latex shell that’s bacon scented and resistant for hours of play. Chewing is a behavior dogs’ exhibit to learn about their environment. Sniffing, tasting and chewing helps them investigate objects and satisfy the natural urge to chew and gnaw as a method of keeping their teeth and gums healthy. Chewing can quickly lead to destructive behavior, so it’s imperative that you encourage proper chewing with appropriate toys. The Hartz Chew’n Clean line promotes mental and emotional wellbeing along with dental benefits which result from chewing. Tugging is a collaborative game that strengthens the bond between you and your dog. It’s a great activity that uses different muscles and parts of your pup’s brain. A functional game of tug mimics the behavior of ripping and tearing apart prey. Hartz Tuff Stuff toys are constructed from durable ballistic-grade nylon to withstand rigorous chewing and ruff-housing to entertain playful pups who are tough on their toys. Many dogs enjoy playing with plush – shaking, chewing, carrying and snuggling up to them. Dogs that quickly rip apart stuffed animals to get to a squeaker are simulating what they would do to their prey. Hartz plush toys come in all shapes, sizes and textures for dogs of all ages and provide something soft for dogs who love to snuggle. Cats, especially those who live strictly indoors, need stimulation to break the boredom. Exploring, exercising and hunting are several natural behaviors that enrich their environment. 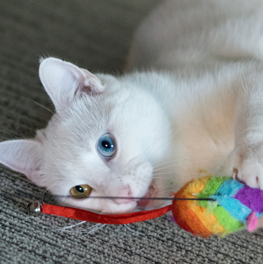 Through play you can improve your cat’s well-being and tap into his innate desires. Cats will swat when they are curious about something or investigating unfamiliar objects. They will also nudge things with their paws to mimic the instinct to toy with their prey. A poking paw at a mouse would send it scurrying, giving your kitty a good game (and possibly a snack!). 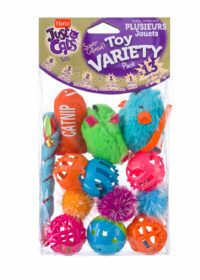 Hartz has plenty of small, lightweight toys that move easily to stimulate your cat’s interest and elicit activity. Cats are natural hunters, but unlike their wild counterparts, they don’t need to depend on killing other critters to survive. However this hunting instinct is still a strong part of your cat’s character. Unleash your cat’s inner hunter with lifelike Hartz toys that mimic the movement and sounds of prey he would encounter in nature. Interactive play is a powerful tool for building trust with your cat, helping multiple cats become friends, exercise and stress relief. 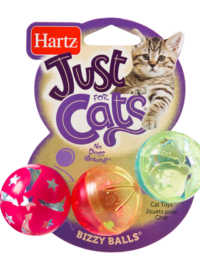 Hartz offers an array of toys that put you in control of creating prey-like action to make playtime more fun! For more healthy pet lifestyle tips, follow Hartz Pets on Facebook, Instagram, Twitter and Pinterest.